Geospatial Survey Solutions and Deri Jones & Associates (GSS/DJA) were asked to carry out a survey of the auditorium of Kings Theatre in Glasgow, which seats 1,785 people. Three days were needed on site capturing data using both the FARO LS880 and the MENSI GS200, the customer required detailed elevation and plan drawings with details of height variations on the floor of each level of the auditorium, as well as section drawings at various positions. The King's Theatre was commissioned by the Edinburgh-based theatre company Howard & Wyndham at a cost of over £50,000 when it opened on September 12th 1904. In 1990, after the City of Glasgow became the European City of Culture, the theatre was the venue for the opening. Over the years many actors have graced the stage of The King's. These included Sir Lawrence Olivier, Sarah Bernhardt, John Gielgud, Katharine Hepburn and Tyrone Power. A young Michael Jackson even featured there as part of a Jackson Five appearance at a Royal Variety Performance in the late 1970s. Ambassador Theatre Group, the company that currently runs Kings Theatre, took control of the theatre's day-to-day management in 2002. GSS/DJA carried out a survey on the auditorium in preparation for extensive refurbishment of the interior of the building due to commence in the summer of 2009. The main architects, Simpson & Brown, knew the capabilities of the technology, having used our services on both the Penicuik House and Craigievar Castle projects, and required detailed elevation and plan drawings of the entire auditorium, section drawings at particular locations, and information about floor heights to give an indication as to the level of damage caused by a flood some years earlier. 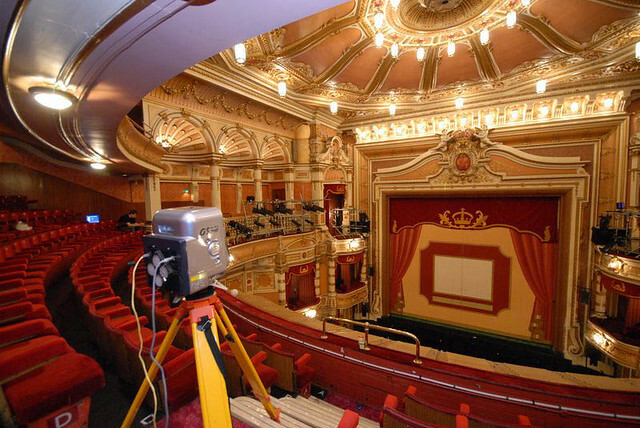 Some of the surveying was carried out over night to avoid disruption to the working theatre and the scanning schedule was adapted to work around cast rehearsals and stage building. Both the Faro LS880 and Mensi GS200 scanners were used in this project, as the size of the auditorium meant that the level of detail provided by the Faro scanner at the furthest reaches was not as high as could be provided be the Mensi. The Faro's portability proved to be very important, working in the many different levels and stairways of a working theatre. 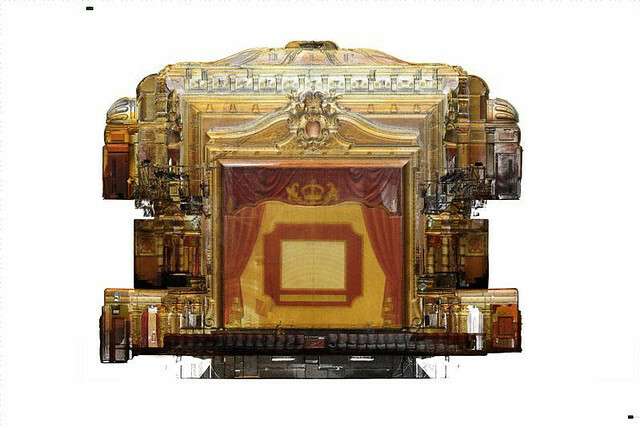 Over a period of three days, some 60 full colour scans were completed, capturing a myriad details throughout the theatre. The data was compiled using Faro Scene, and then exported to Pointools and Rhino. 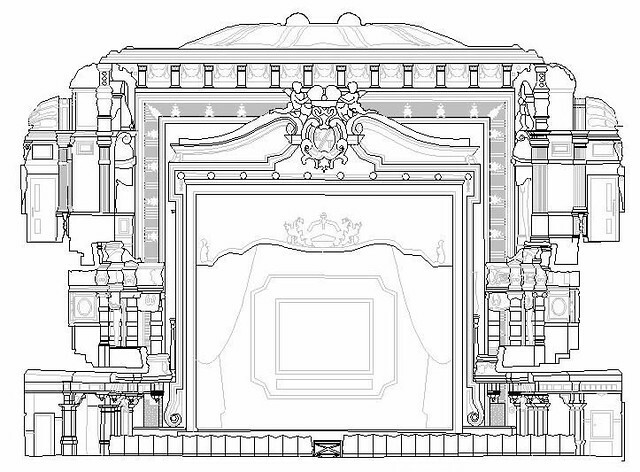 Detailed elevations and sections of each of the auditorium faces were drawn up in CAD and a record drawing of the complex ceiling. 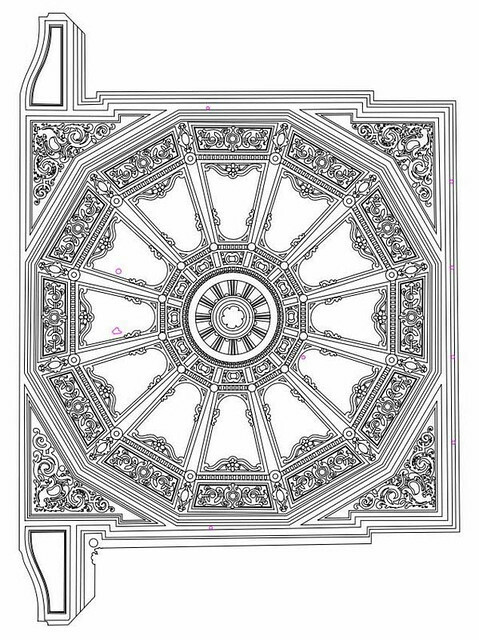 The auditorium details were incorporated in to the overall building survey, with the DJA/GSS data being aligned to the survey by Loy of Glasgow to millimetre accuracy. Spot heights for floors, balconies and seating levels were supplied, with the final deliverables package consisted of over 7.5 GB of data, a complete record of the auditorium prior to renovation.